It is National Taco Day people. 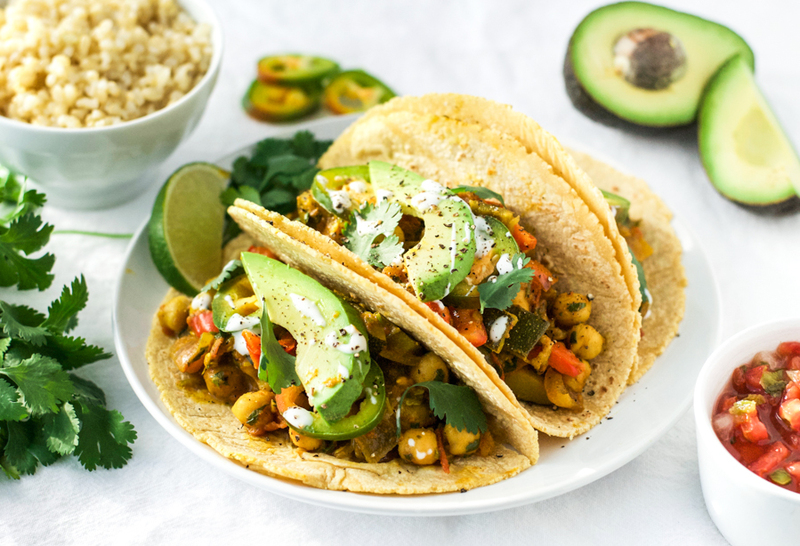 So what better way to celebrate than with these nutritious roasted zucchini and chickpea tacos. Yes, tacos can be healthy and delicious at the same time, as long as you don’t pair them with a full pitcher of margaritas! 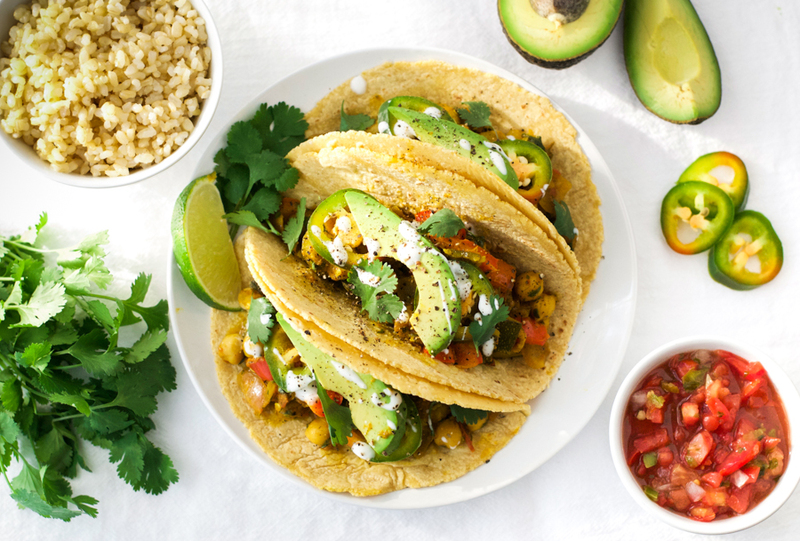 These tacos are made with roasted vegetables, freshly squeezed lime juice, and plenty of cilantro, packing some serious nutrition punch. In fact, a serving of 2 tacos with avocado, yogurt, salsa, and a sprinkling of grated cheese provides 60% of a woman’s daily fiber and about 25% of her daily protein needs, all for just 369 calories. Not bad for a meal that tastes both comforting and indulgent. 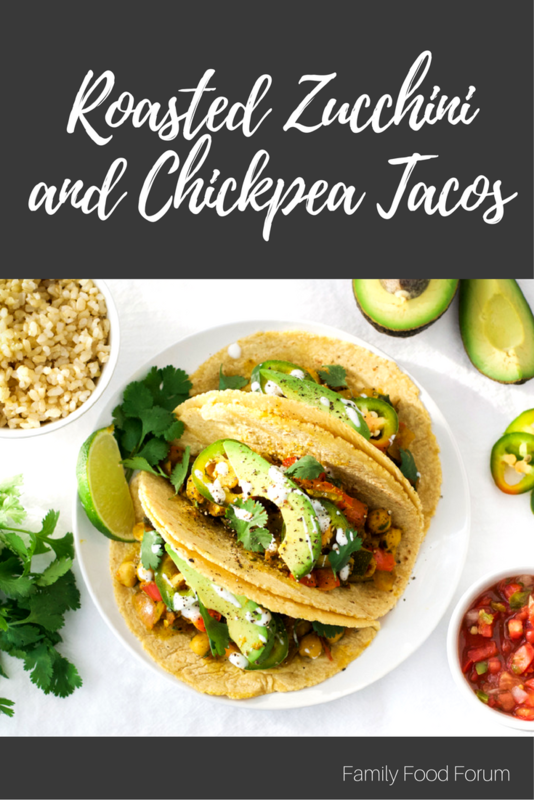 Another great thing about these roasted zucchini and chickpea tacos is that they make the perfect family style dinner. Family style dinners are an excellent way to encourage children to become more adventurous with their food choices. Simply place the roasted vegetables, corn tortillas, and all the toppings in separate dishes on the dinner table and let everyone make their own tacos. It is fun to do and will help selective eaters feel less overwhelmed by the idea of trying new foods. Just make sure you have plenty of napkins ready. It can get messy! Dice the onion, zucchini, tomatoes, and bell pepper, and put in a large bowl. Add the olive oil, curry powder, turmeric, garlic powder, salt and pepper to the bowl and mix well. Spread the mixture out on a large baking tray and put in the oven for 15 minutes. Once the 15 minutes is up, add the garbanzo beans to the zucchini mixture, stir, and put back in the oven for another 10 minutes. Remove from the oven, put in a serving bowl, add the cilantro and lime, and stir to combine. Meanwhile slice the avocado, grate the cheese, put the yogurt and salsa in serving dishes, and warm the tortillas. Place everything on the table family style and let people make their own tacos. You are right – lots of healthy ingredients in these tacos. And yummy ones too 🙂 Thanks for your comment.